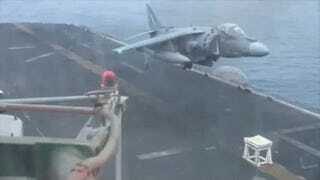 They say Harrier pilots are some of the best in the world as the aircraft is notoriously hard to handle in hover. This video is further proof that this statement is true. Talk about nailing it! Note to Lockheed Martin: Build custom nose stool for the F-35B! Thanks to alert5 news blog for posting this!